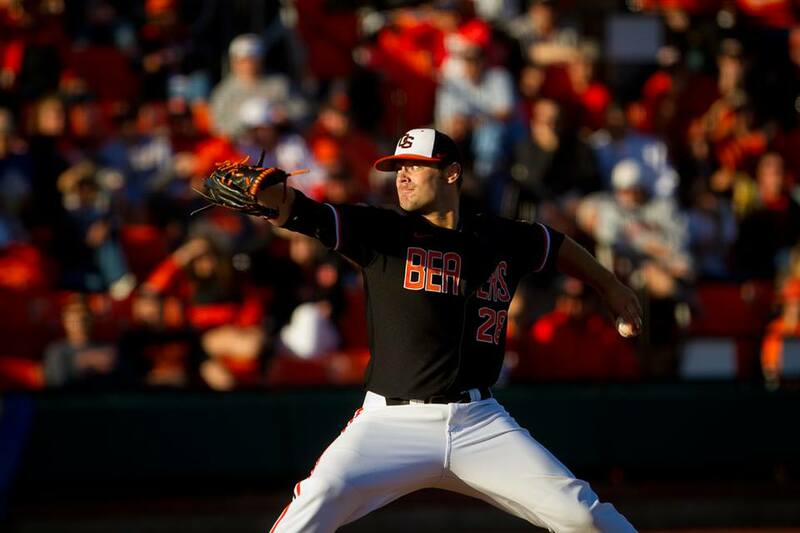 Oregon State starter Ben Wetzler may have had a rough go-of-it in the first inning, but the junior from Clackamas rebounded and pitched dominantly throughout the rest of OSU’s Corvallis Regional Championship Game against Texas A&M, helping lead the Beavers to a convincing 6-1 victory. The win also propelled Oregon State to the NCAA Super Regionals, where they will face Kansas State. Surrendering the lone for the Aggies in the first inning on a triple by Cole Lankford, Wetzler settled down and pitched a complete game, giving up four hits, one run, and one walk while striking out 10. Earning his eighth victory of the season, he was aided by the Beavers’ offense in the latter innings of the game. Ben Wetzler was dominant for the Beavers on Sunday. Blanked through the first four innings by Texas A&M starter Grayson Long, Oregon State managed to push a run across in the fourth inning, tying the game up at one apiece. Pitching a total of 5 2/3 innings, Long would record a no decision in the game after giving up six hits, one run, and two walks while striking out three. He left the game with it knotted up at one. Reliever Matt Kent made easy work of the lone Oregon State batter he faced, finishing off the sixth inning without surrendering a run to see the game deadlocked with just three innings to play. Unfortunately for the Aggies, Jason Jester would not see the same success on the mound as his teammates, surrendering two runs in the seventh to allow the Beavers to open up a 3-1 advantage. The tie was broken when Danny Hayes launched a double to right field that plated two runs to give Wetzler all the support he would need to secure the win. Jester would eventually record the loss in the game, pitching 2 1/3 innings while giving up four hits and two runs. A two-run lead already established heading into the ninth, Oregon State tacked on three more runs off A.J. Minter to give Wetzler a few more insurance runs. The Beavers recorded three RBI singles in the inning, with Hayes, Ryan Barnes, and Kavin Keyes all pushing home their teammates. Five Beavers recorded multi-hit efforts in the game, with Barnes leading all batters in the game with a 3-for-5 effort that saw him collect one RBI. Hayes went 2-for-5 in the game, scoring a run and driving home three. Aside from earning the victory in the contest, Wetzler notched his eighth-straight win while tying his career-high in strikeouts with 10. Oregon State will now take the next few days off before returning to action against Kansas State in an NCAA Super Regional that is to be played at Goss Stadium. The first game will either be played on Friday or Saturday.